On the occasion of the 90th anniversary of the birth of the legendary Miles Dewey Davis, here’s my up close & personal moment. Every journalist who had the unique experience of interviewing Miles has a story about that encounter, so here’s mine. Its fall of 1974 and the electric Miles, with Pete Cosey and Reggie Lucas on guitars, Sonny Fortune on saxophone, Michael Henderson on bass, Al Foster on drums, Mtume on hand drums, and even a third guitarist, young Dominique Gaumont, flown in for what was apparently a week’s tryout, is holding court for a week at the old Smiling Dog Saloon in Cleveland. My good friend and fellow journalist Robert Fleming (scroll down for an interview on his new book project) and I simply must interview Miles! We spend one revealing evening at the Dog sizing things up. On the second evening we sense an opening and, hats in hand, make the big request. And we sit… at one point the door to the adjoining room opens just a crack and we can spot a shadowy figure in the next room: the Master in his bathrobe! And we sit… one hour passes, a second hour passes… still no sign of progress. By this point the door has opened just a bit wider and we can intermittently spot what is now clearly Miles passing across the open doorway in the midst of some task or other, no words yet exchanged. A third hour passes and we’re stuck with a Saturday afternoon, late Fall NFL tilt on television; this being 1974 and the days of the Steel Curtain dynasty, naturally its the Steelers – erstwhile tormenters of our hometown Browns – on the tube. Paying partial attention to the television, but much more to the occasional passing of that dark figure in the adjoining room past the doorway and our field of vision for just a fleeting moment. Had our luck suddenly changed? Indeed it had, clicking on Play/Rec on our trusty cassette recorders – we dare not miss even one pearl of Milesian wisdom – we sit down in the company of the Master. Once seated, for the next three hours(!!) 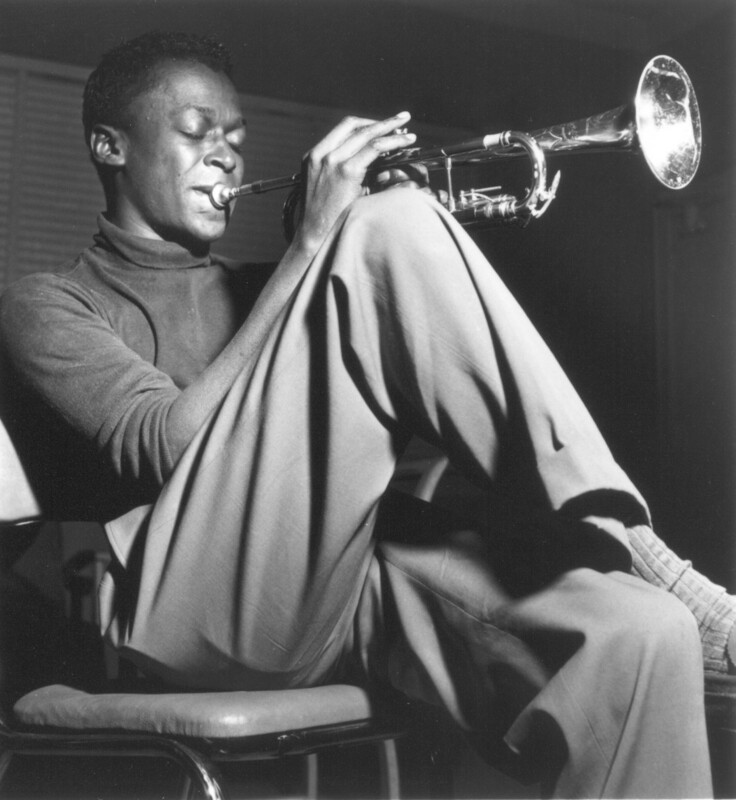 Miles regales us on myriad topics, from why he was currently going without keyboard or piano in his band (“I don’t need ’em…”) – including a few pearls on some of his faves – Herbie, Chick, George Duke… – to the then current state of trumpet playing (his three faves at the time – Woody Shaw, Don Cherry, Lester Bowie… with a bit of obvious contempt for Freddie Hubbard) – to his recording exploits (at the time telling us he had what he estimated as audio footage in the can enough for “…about 80 albums…”, a fact so far substantiated by Columbia’s ongoing policy of cranking out endless unreleased Miles recordings), to a treatise on boxing, to… Needless to say we were mesmerized! A post-script: Remember, I said this was 1974, at a time when I was just a year out of undergrad years and still quite green as a writer. Well, befitting those youthful days, the unfortunate aspect of this adventure – which both Robert and I later published on our own in separate outlets – I came to that interview armed with one of the world’s cheapest blank cassette brands. Needless to say, after all these years that precious tape is barely – if at all – audible, and knowing Miles legendary whispery voice, you can imagine what that sounds like! So if you know any good cassette restoration services… hit me back! Shiver me timbers, them’s some great inairmftoon.